When a tribe makes it too difficult for young men to be able to pay bride price, considering the huge amount they are also expected to spend on the marriage proper, you will continue to have such mess. These kidnappers of a four-year-old-boy, Steve Kanu, in Abeokuta have confessed that a ransom of N1m was paid to them before he was rescued. The young Steve was kidnapped at his parents’ home at Laderin Estate, Abeokuta, on Monday, November 2, 2015. Dr. and Mrs. Mucipay Kanu, beamed with smile when they appeared with their son at the police command headquarters in Eleweran, Ogun State, on Monday. The suspects arrested for the crime were also paraded by the Commissioner of Police, Abdulmajid Ali. They are: Kenechukwu Amoke (21), Anayo Amoke (35), Oluchi Asadu (20), Maureen Uchenna (25). 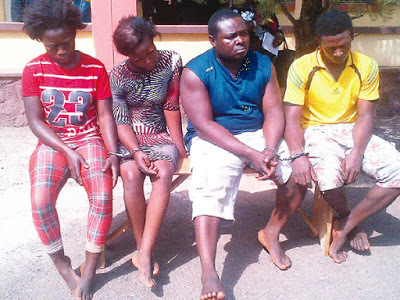 The commissioner, while parading the suspected kidnappers, said the manhunt for Obinna was on. “The boy was kept for eight days in Anayo Amoke’s residence in Isale Ibefun in Abeokuta, before he was moved to Nsukka, where they kept him in Oluchi Asadu’s house,” the CP said.